I thought long and hard about what recipe I would feature on my 100th blog post; fancy sweets or simple tea cakes, stylish cupcakes or a super complicated iconic recipe? Then I just took a moment to think about why I decided to do this in the first place: I just love to cook. I love baking, I love tasting and playing with flavours, and Laaaawd knows I love eating (my rapidly increasing waistline is testament enough to that). I started blogging as a coping mechanism, let’s be honest here. I had just started a new, really tough, corporate job, broken up with my boyfriend, and just really needed to get back to what I like to do in my own time. Cooking and baking became the way I had quality time with myself, and blogging was my way of staying connected to the world. Sometimes the routine of our daily lives get to us and we forget to just sit back and like ourselves. I got to a point where I really did not like who I was, and I really did not know what I liked. So I started this, and you know what? It’s been an amazing experience the whole way! I never expected to stick to it til this point (I’ve left a trail of half-started blogs on the world wide web in the past ten years), and I certainly didn’t expect to actually have readers. So to the friends and family who have given me so much love and encouragement over the past year, thank you so much! 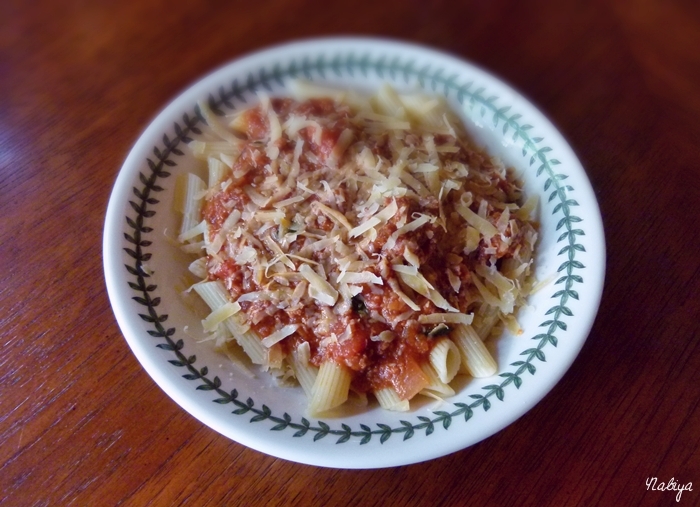 I’m going to share the recipe of the first dish I ever made: bolognese sauce! It’s nothing fancy, it’s nothing new, but it was the first thing I cooked in my life, and it’s still my favourite dish to make when I have the time. It’s my mum’s recipe, and I may have tweaked it here and there over the years, but the premise for the idea is still there. Heat your pot and pour in enough olive oil to just coat the bottom, then toss in the diced yellow onions and garlic. Just cook until they soften up, you don’t want colour or crispiness on them. Toss in the minced beef and mix with the onion and garlic until slightly browned. 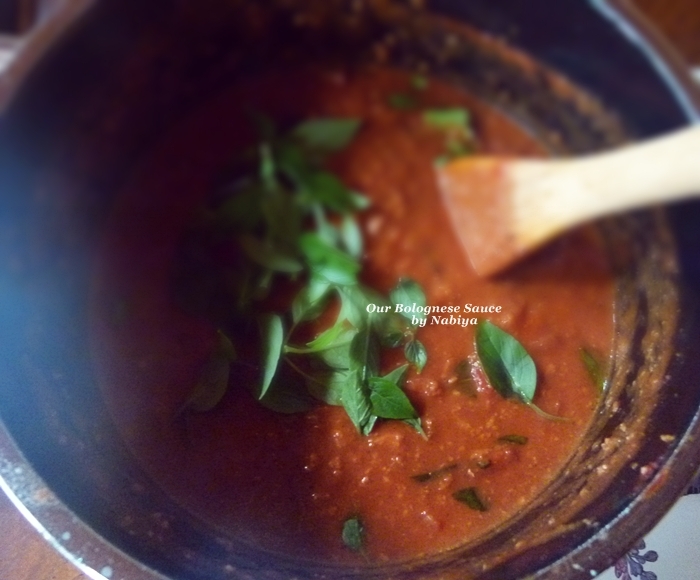 Pour in the tomatoes and puree, and what I like to do is fill the puree can with water and pour that in as well. Just get all that tomatoey goodness out. Allow the mixture to bubble and boil before turning the heat down to a low simmer, then pour in milk or cream to add a little thickness to the sauce. Stir in the hand torn basil leaves, and season to taste. 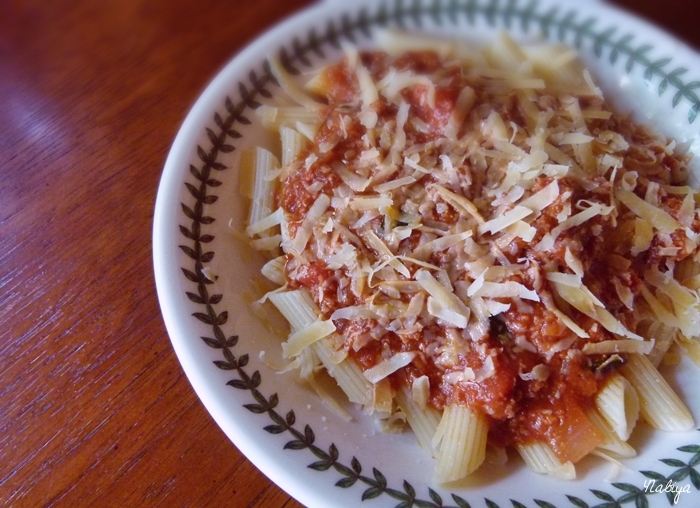 Serve over your pasta of choice, and grate on some parmesan.